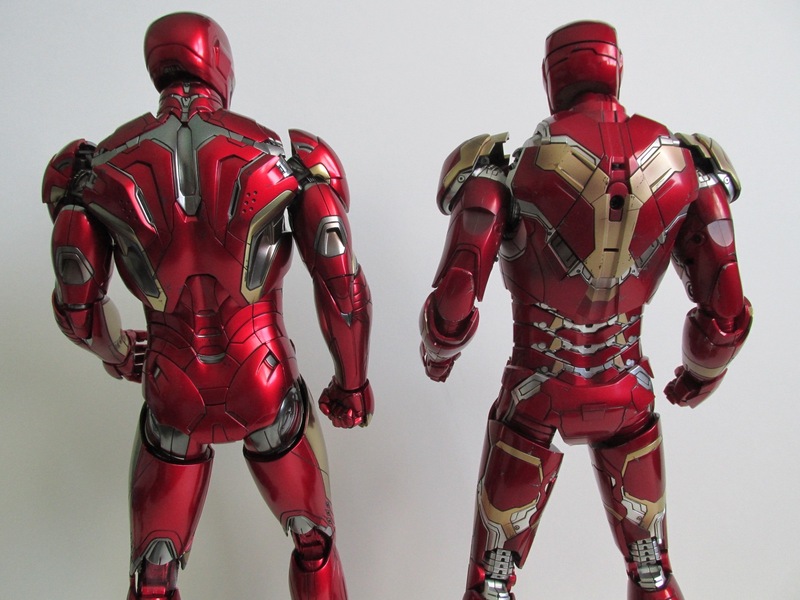 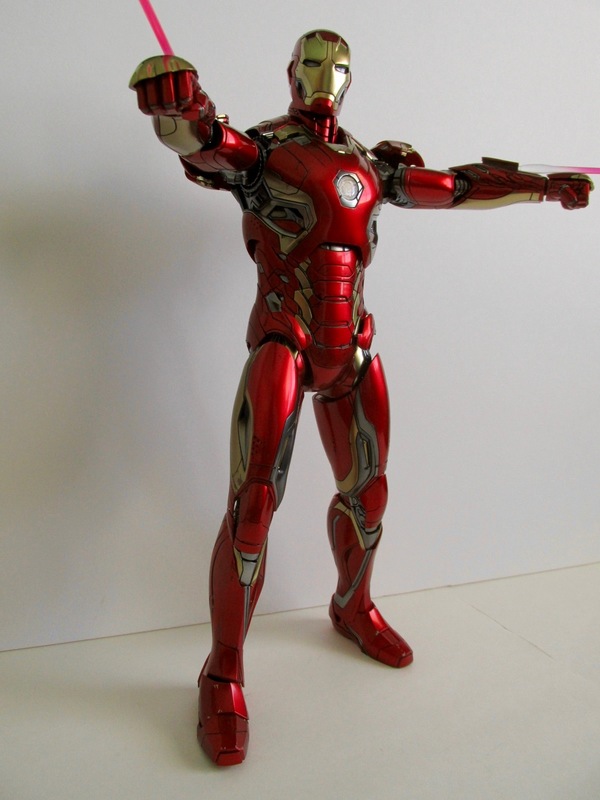 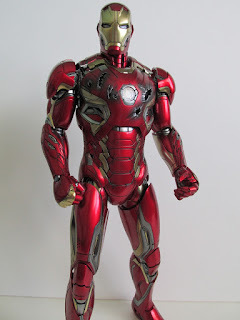 It's taken awhile, but finally the Mark XLV has been released. 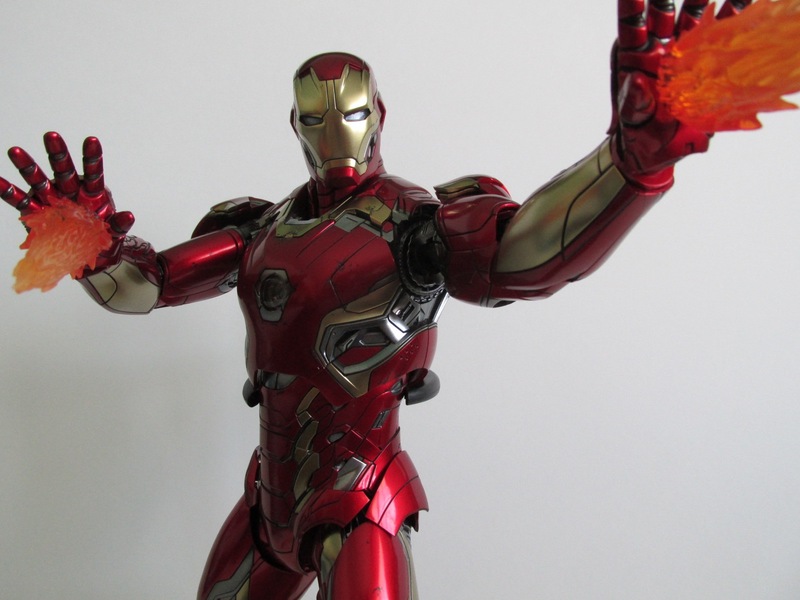 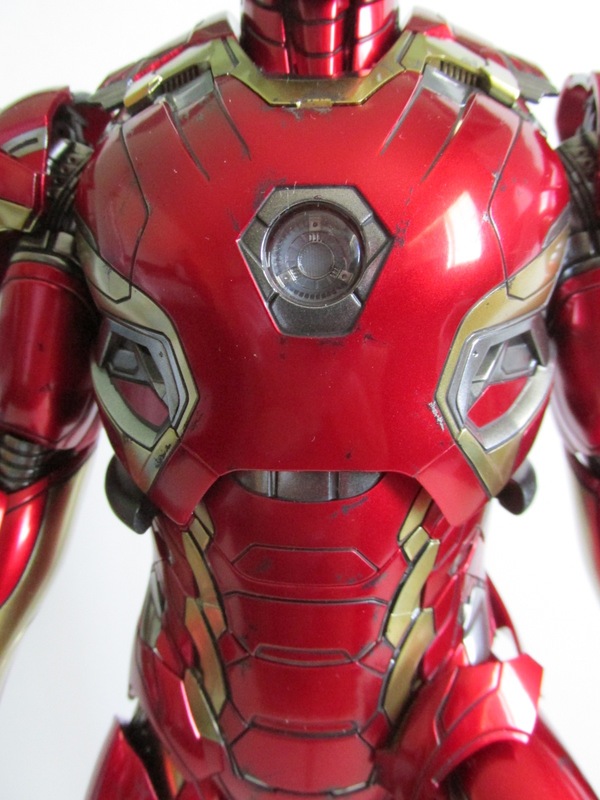 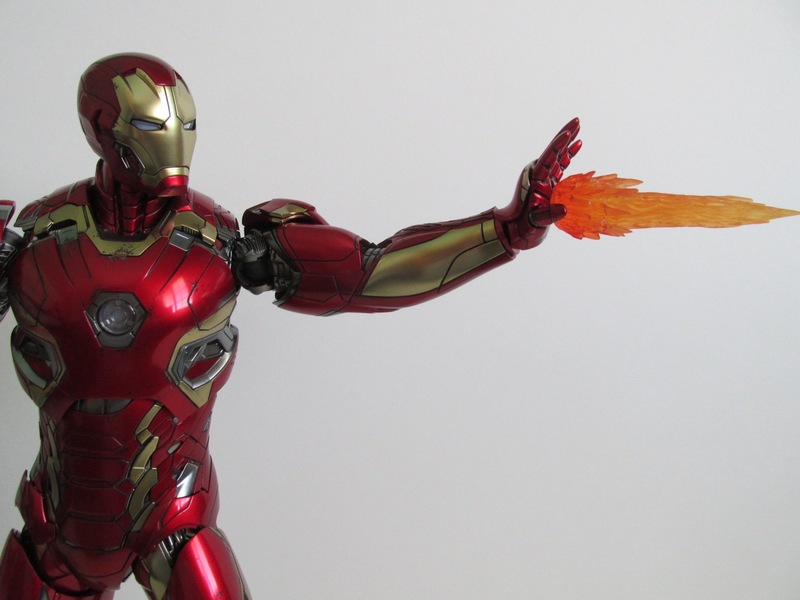 Based on his appearance in the battle against Ultron in the film's climax, this latest in Hot Toys's Die Cast series does not disappoint. 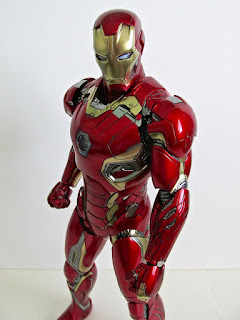 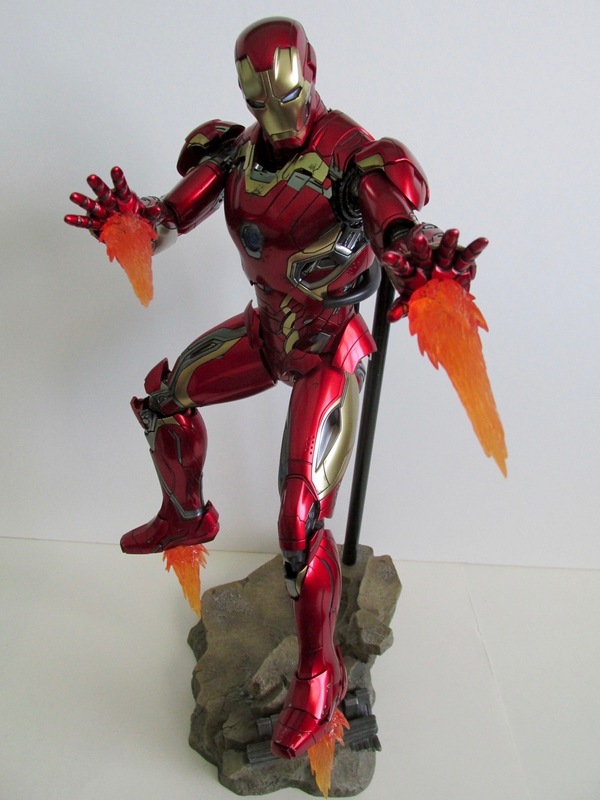 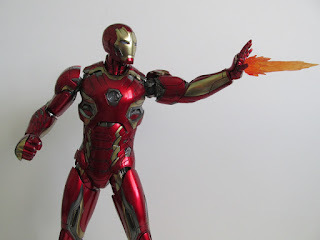 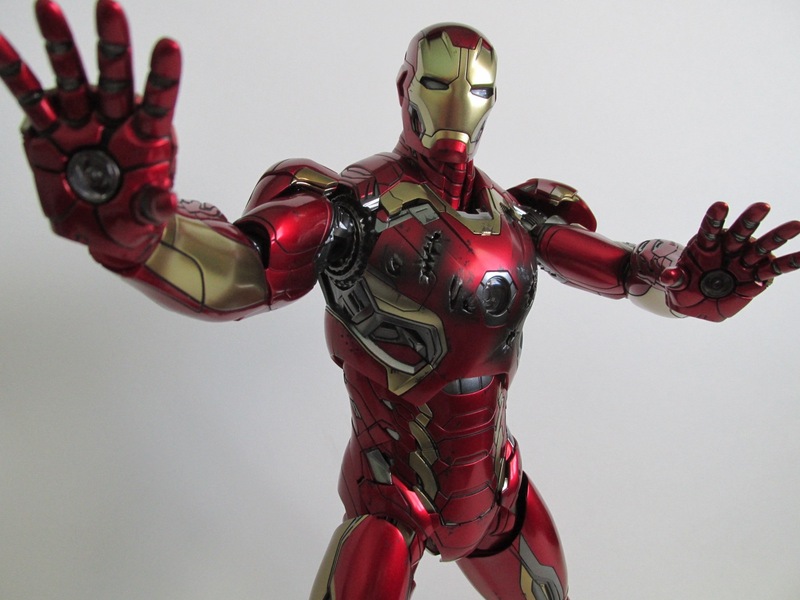 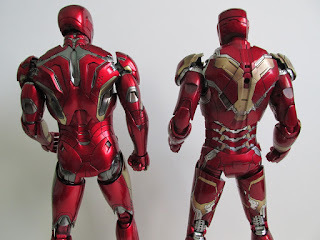 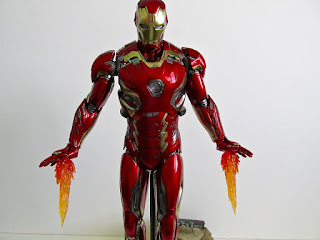 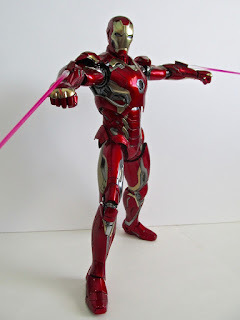 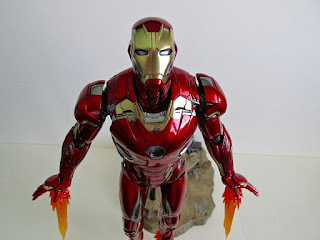 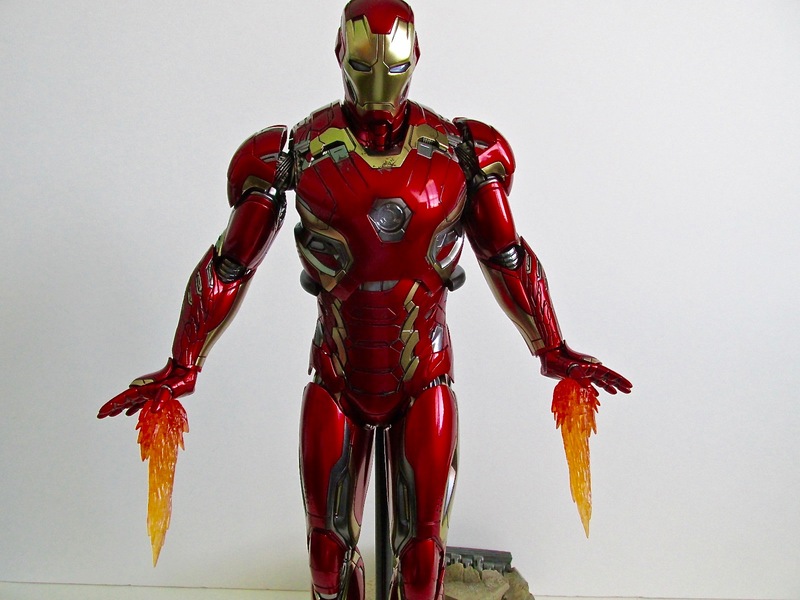 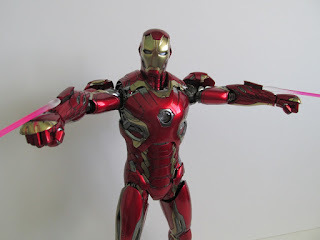 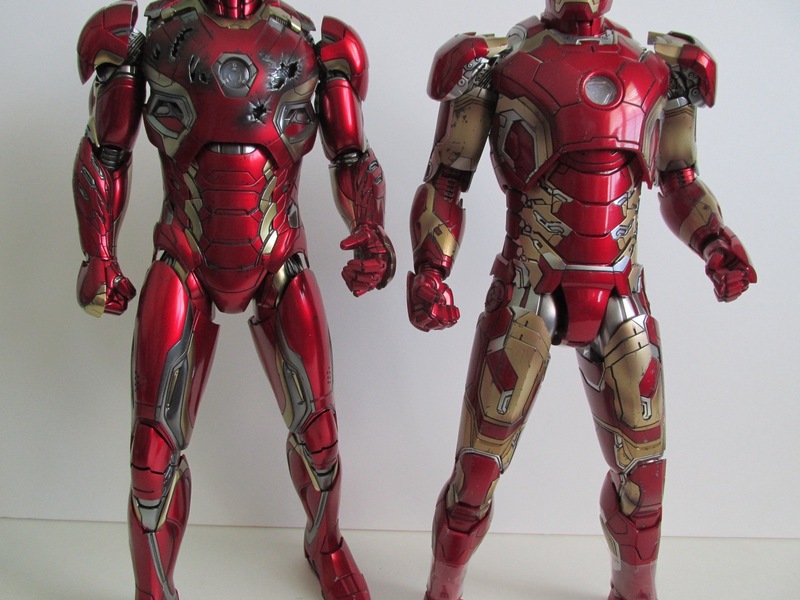 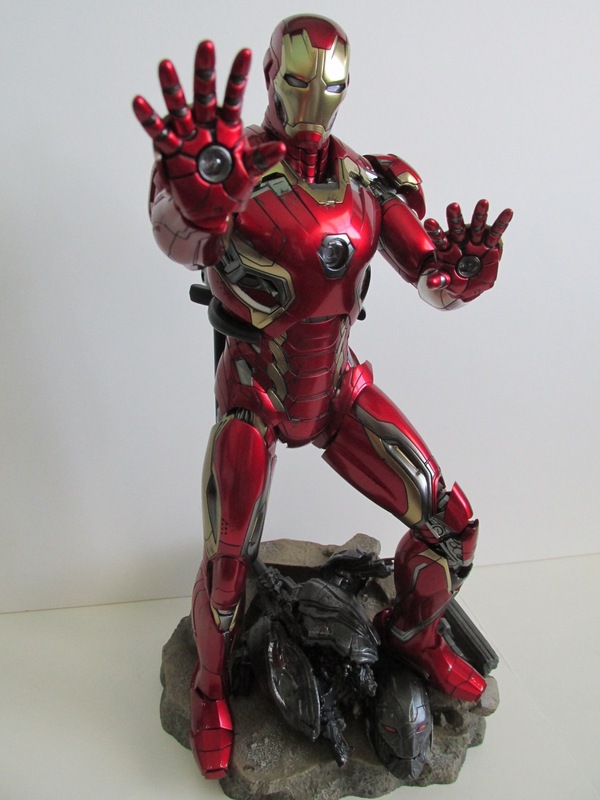 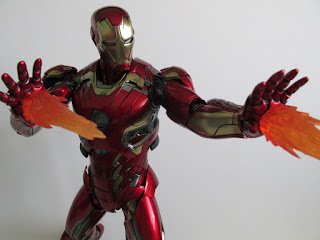 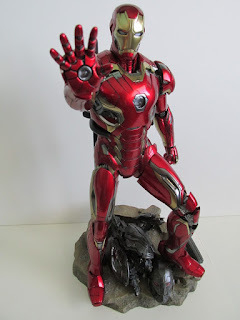 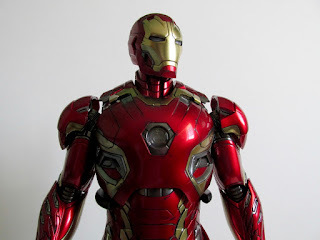 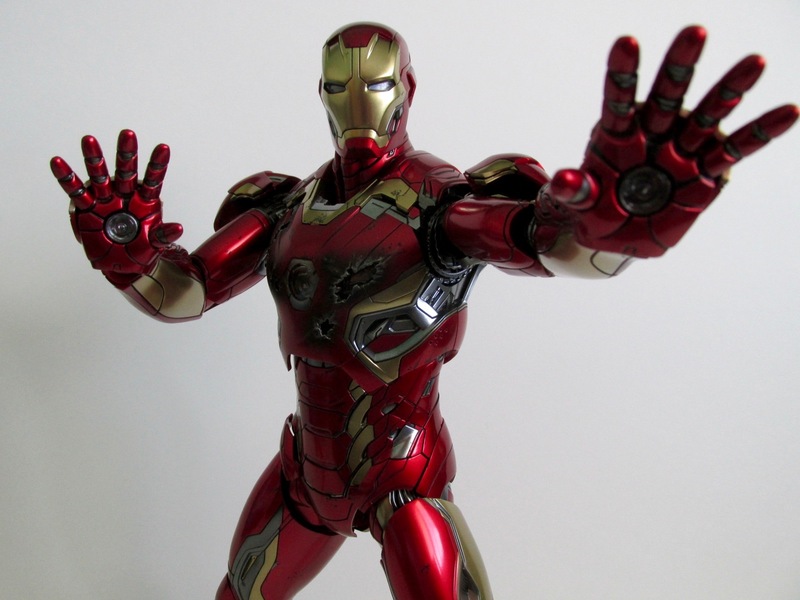 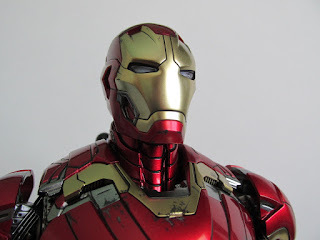 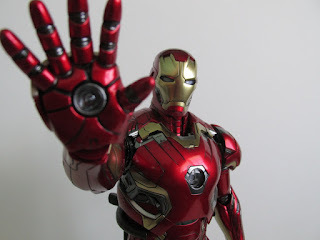 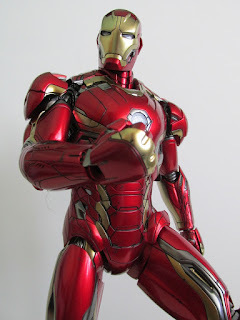 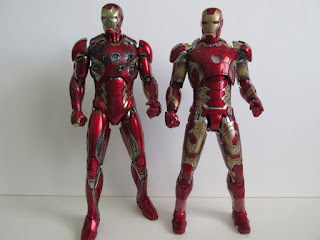 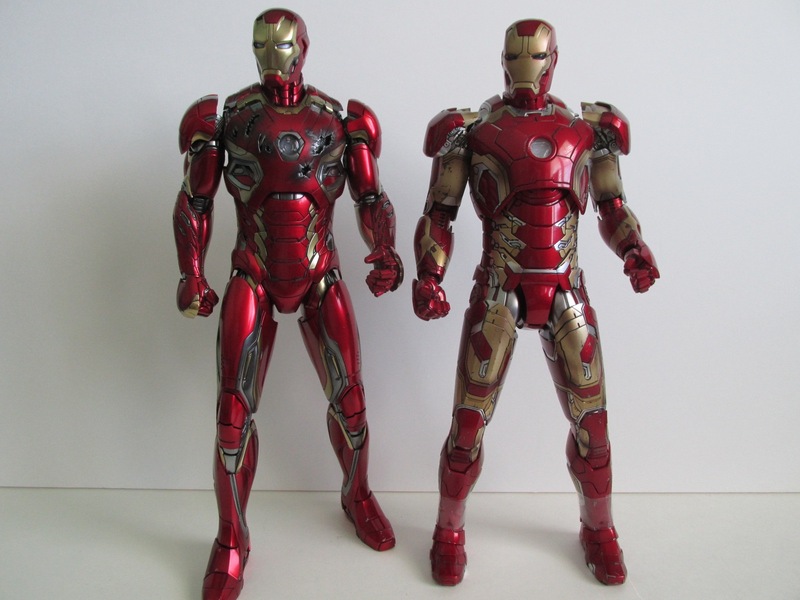 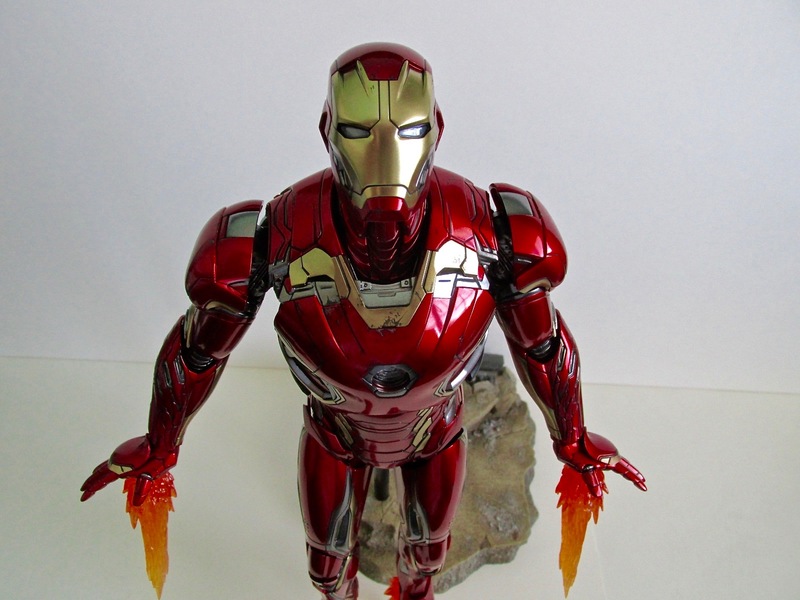 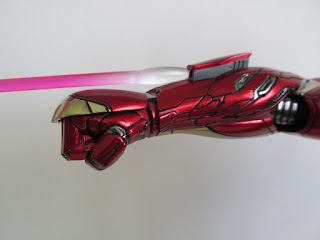 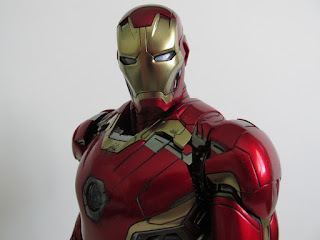 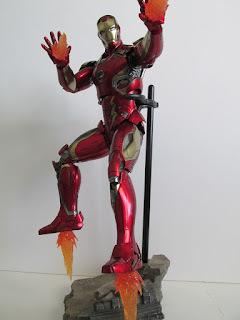 With a mix of slight wear and pristine metallic paint, the paint job on this figure is amazing, and I think makes this one of the better Iron Man releases. 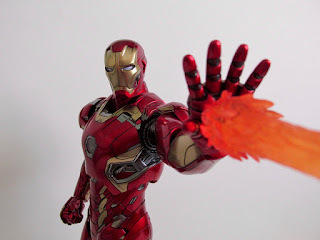 The sculpt on this figure is good too, but I'd say the paint job is what really makes this great. 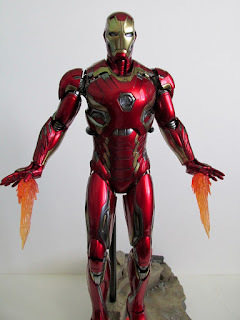 This figure also takes a page from the recent 1/4 scale Mark XLIII in the form of "white" lights. The arc reactor and eyes now have an opaque white color instead of a clear, translucent appearance. 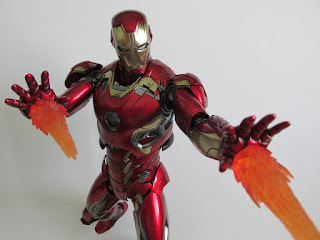 You can still put in batteries to make the figure light up, but now you can have the lights off and still make it seem bright in those areas. 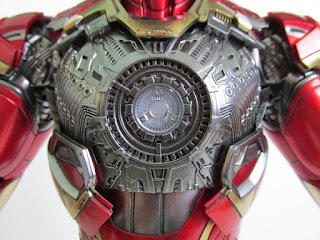 I like this addition, and it makes a bolder, more intimidating appearance on his face plate. Accessories wise he comes with the usual assortment you would normally get in an Iron Man release. 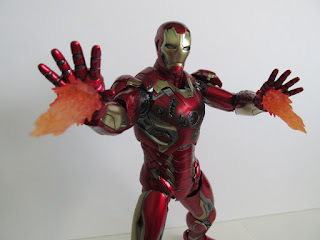 You get; a pair of fists, a pair of repulsor hands, a pair of articulated hands, a pair of hands with repulsor fire effect, a pair of fire effects for the feet, battle damaged chest piece, two purple lasers, Ultron Sentry chest and head, special base, dynamic rod, and metal rod. The battle damaged chest piece is probably the best accessory in this release and has some nice weathering effects. 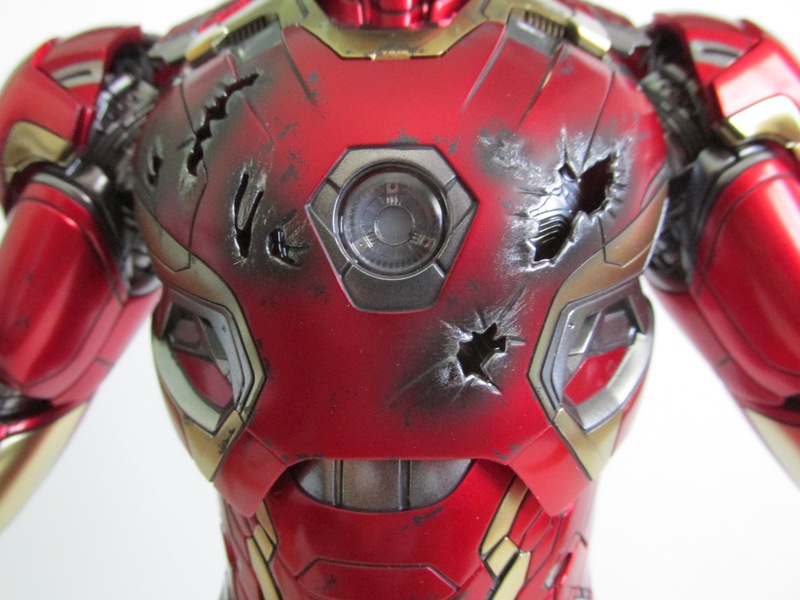 It's too bad more battle damaged pieces were not included. 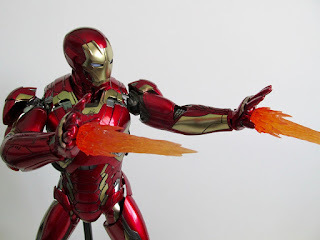 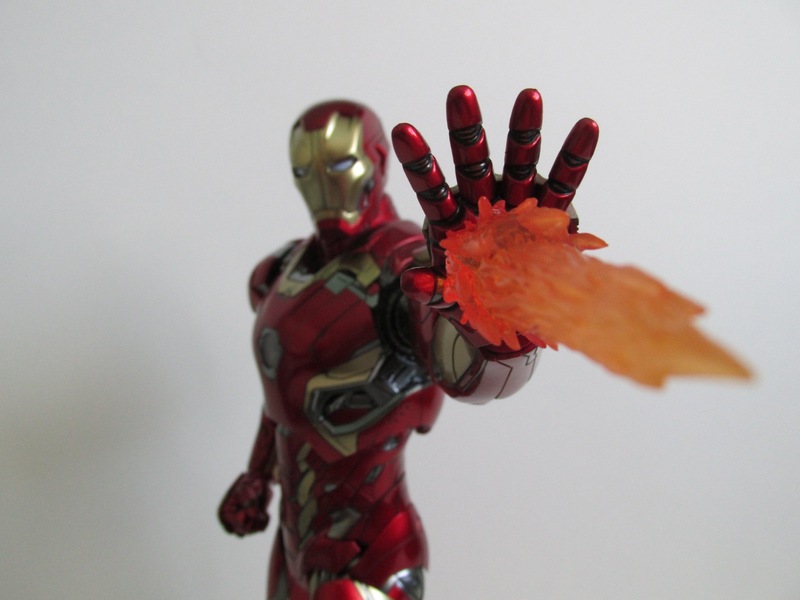 The special effect flame and laser accessories are kind of cool. 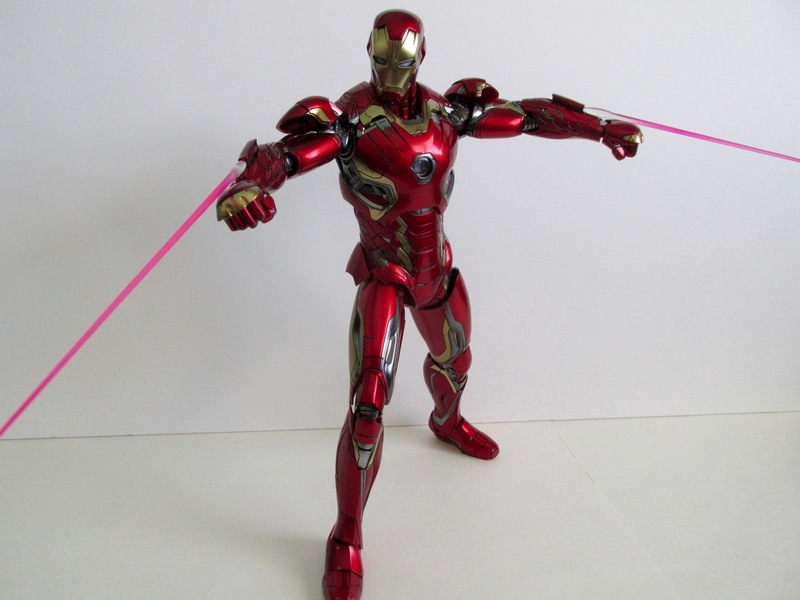 The lasers look great, but I probably won't display the lasers. 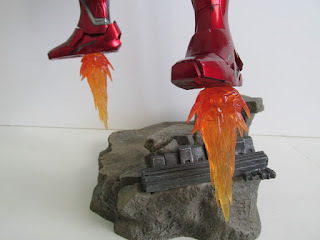 While they do look more toy like, the flame effects aren't as bad as many have felt. 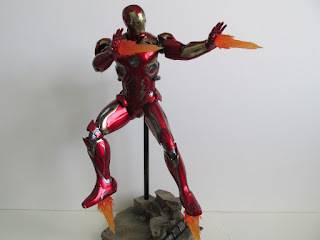 I do like this figure a lot, but there are some gripes I have with it. 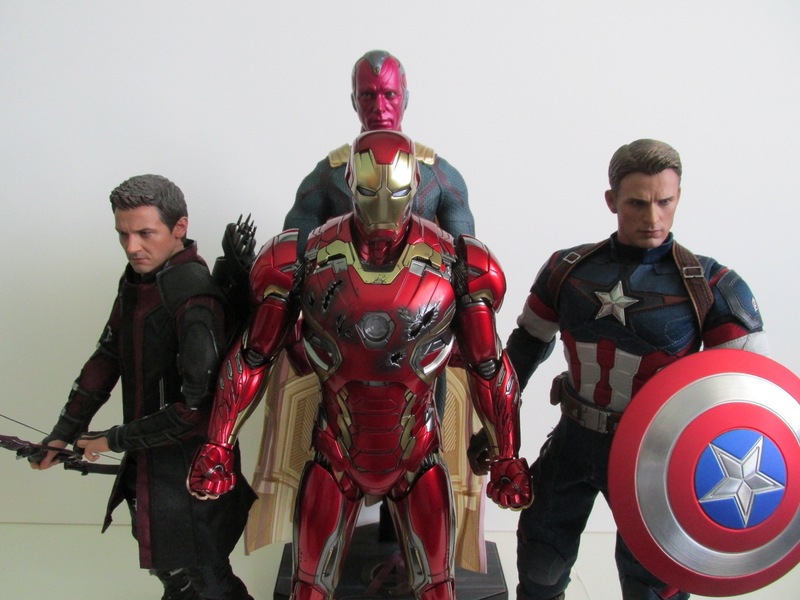 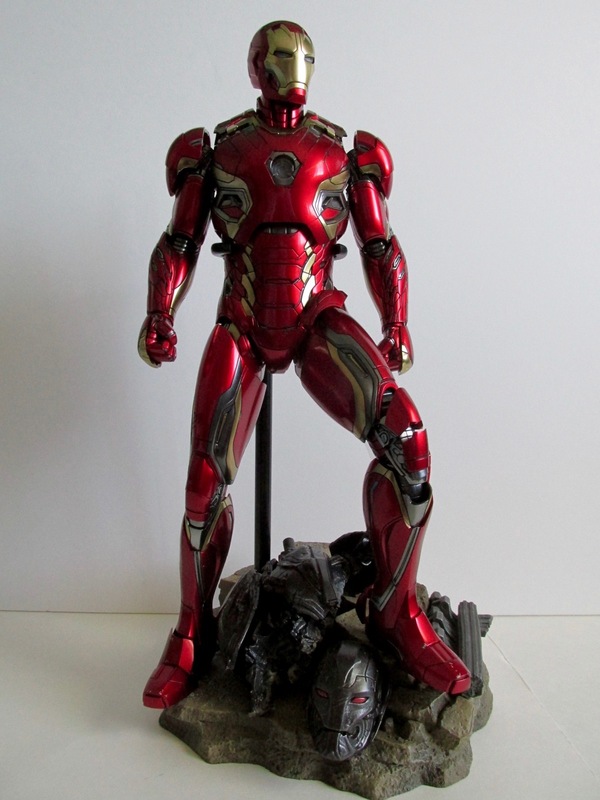 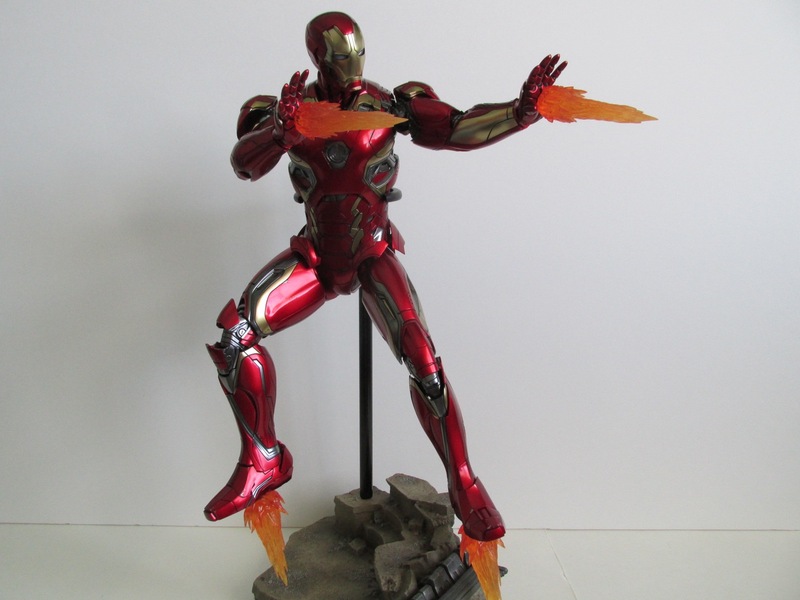 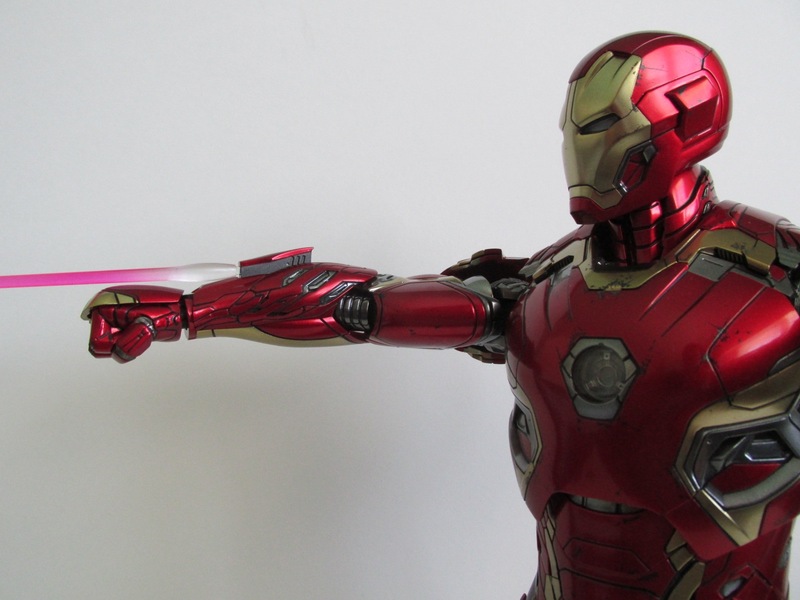 First off, you can't palm the Ultron Sentry head like it is in the official photos. 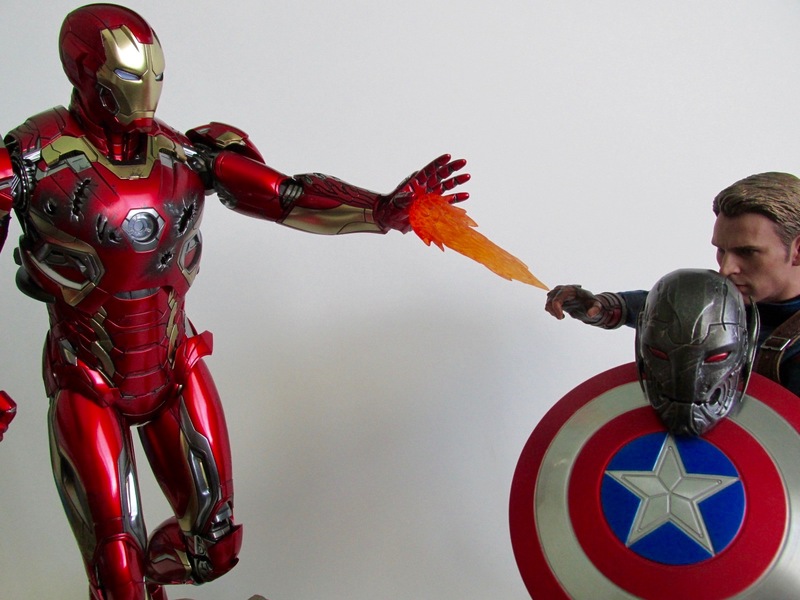 The hands are not made for that kind of grasp. 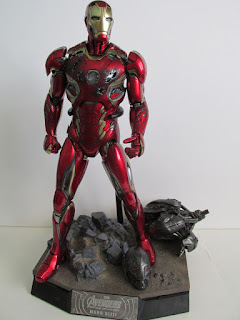 The Ultron Sentry body and head take a lot of the space on the base so it's kind of hard to get the figure and the Sentry all on one base. The rods included aren't the best option to do flight poses. 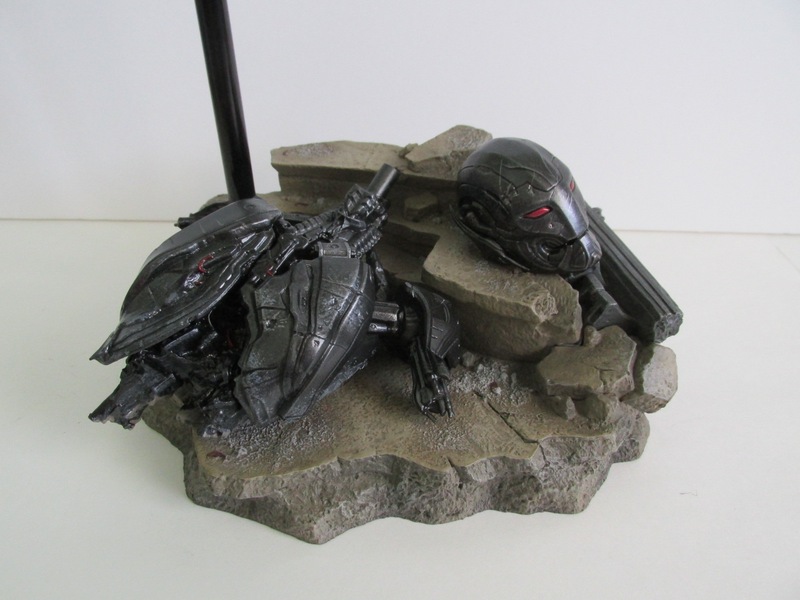 Since the figure is heavy, the cradle and clamp just can't hold the figure for long periods of flight. 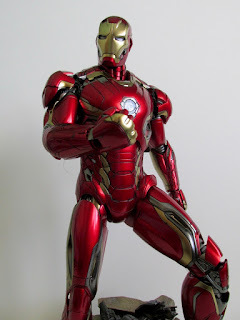 This figure does have a, "Sideshow Exclusive", sticker, but I'm not sure what is exclusive about this release. Accessories were okay with this release, but the real star is of course the figure, and I'm very happy how this turned out. 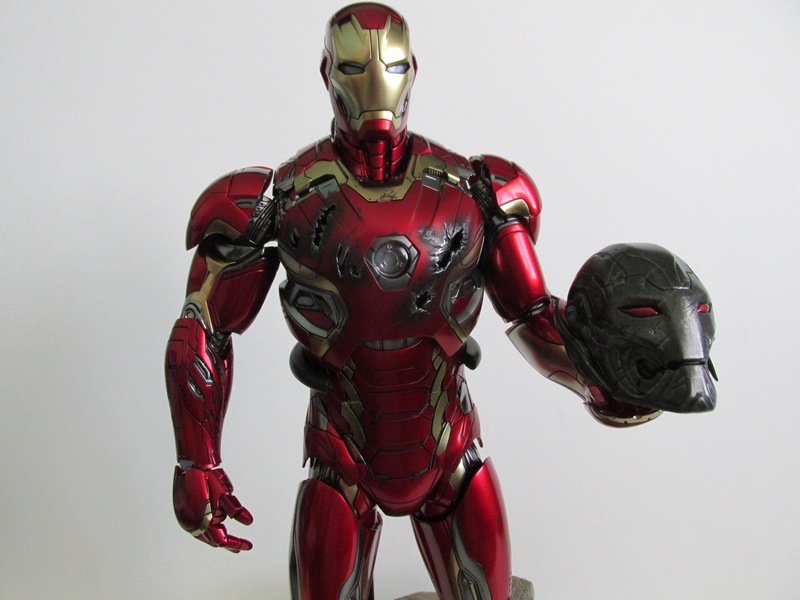 I would have loved a Robert Downey Jr. head, but for movie accuracy purposes, he doesn't come with one since he doesn't take his helmet off when he wears this armor. 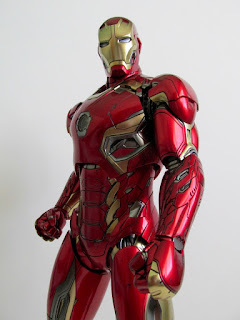 The real question collectors will have is should they buy this figure or buy the 1/4 scale version. It's a toss up in my opinion since both are great. I guess it depends on your shelf space at that point. Regardless of your choice, I highly recommend this Iron Man figure. 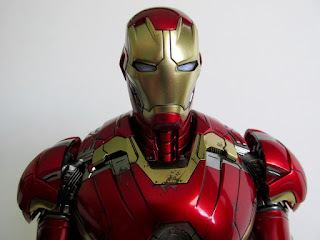 The 1/6th scale figure is available at Sideshow Collectibles click here! 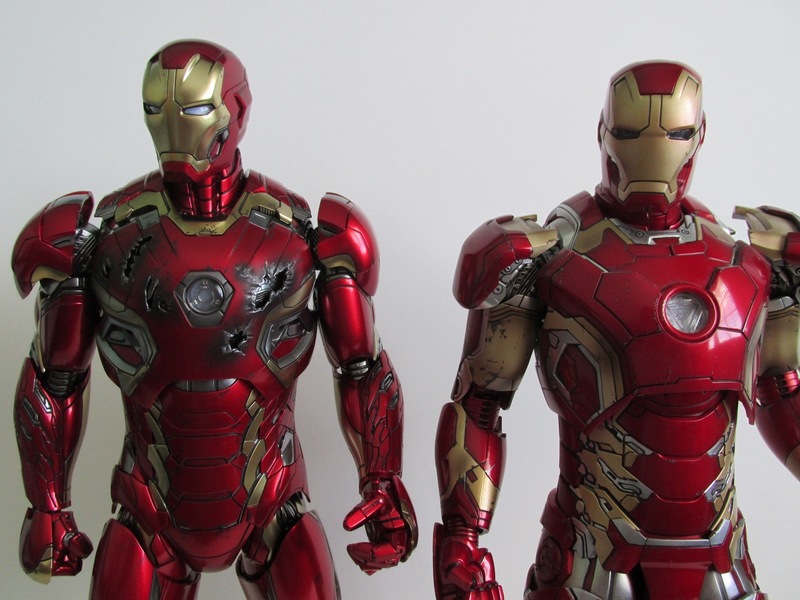 The 1/4 scale figure is up for pre-order at Sideshow Collectibles click here!